Summer is almost gone and that vacation is lingering somewhere in the future. So what’s stopping you? Don’t let the challenges of travelling with your pet keep you from a much needed break of the pressure of everyday life. We have put together a list of tips that will make you wonder why you put off all of those past vacation ideas. 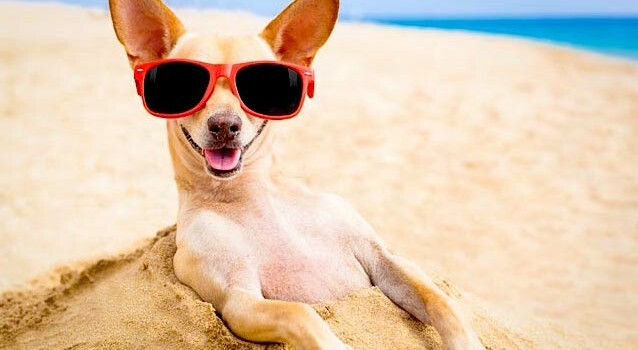 Whether you’re the type of vacationer that’s wants to lounge on the beach, sight see or get back to nature, you should consider the type of vacation that will jive with your pet’s personality. For instance, if your dog doesn’t care much for water, then perhaps a beach or lake getaway isn’t the best vacation idea. Think of your pets favourite activities and find a way to incorporate that into your vacation plans. Remember that change and new environments can agitate your pet and increase anxiety or stress levels. It’s important to make them as comfortable as possible. Bring whatever you can to ensure that they are comfortable and have a piece of home with them. Toys, blankets and beds will help your pet to adapt easier to a new environment. While planning your getaway it’s a good idea to do some research and find out what kind of pet-friendly accommodations or attractions that you can enjoy. Think about where you plan to sit down for meals and the types of activities you want to do that will still allow you to bring your pet along. You don’t want to leave them in the hotel all day, so a little planning will ensure that you’re not having to make stops all day dropping off and picking up your pet. Remember to update your pet’s information and your contact information should your pet get lost or run away. Anything you can do to be prepared for the unthinkable will save time in a crisis. Lastly and probably most importantly, is to find pet-friendly accommodations before you begin your travels. Nothing will through a bigger wrench in your plans than not being able to find accommodations for you and your pet. There are typically some rules and restrictions most hotels will have that relate to your pet so be sure to find out about anything that may affect your trip. There may even be breed and weight restrictions so make sure to do your research to avoid any issues. Always read the fine print! Some places will charge a non-refundable damage deposit or extra fees so make sure that you are aware of all extra charges before you book your hotel.